I guess they have no shame, for by the time this “snow event” was finished, we had a good four inches on the ground. Fat, wet flakes that drifted and blew in from a southerly direction, blanketing yards, roads, trees, and whatever else was outdoors. Yes, it’s pretty. Well, it is when it appears the week before Christmas and departs the week after New Year’s. Three weeks is about all the snow I care to “enjoy” these days. Not that I particularly enjoyed it even as a kid. I remember my mom bundling us up, sending us outside, then rolling her eyes in exasperation when our freezing selves reappeared at the door, ready to come back inside after less than a half-hour! This year, I felt most sorry for local restaurants. They advertised Valentine’s Day specials, accepted reservations, and waited to fill their tables with patrons who surely opted to order in a pizza instead. And since the kids were out of school for Presidents’ Day, the street department obviously didn’t feel too inclined to plow the roads, assuming most people could just stay home. Mama, come out and play!! This entry was posted in Seasonal and tagged cold, Olympia, snow, Valentine's Day, Winter. Bookmark the permalink. A “melting pet”? Absolutely! And I especially love stepping in icy water with my fuzzy socks on…not!! It’s not so much that I hate snow — I just don’t like the cold wetness of it. And Dallas has a knack for trying to get me to “enjoy” it with him. 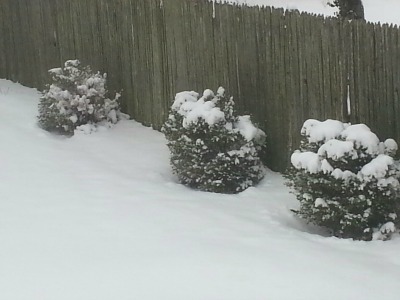 Now they’re telling us it could hit 60 degrees by Friday, so with luck, this mess will all seep into the ground! You’ve got that right, Barb! There might have been a few brave, determined souls who ventured out in this storm, but I wasn’t one of them. I rather enjoy having a car without dents in it, one that’s tucked safely in my garage, not in a fix-it shop!! Brrr. Try to stay warm. At least our power stayed on. Thankfully! Bet these photos bring back “warm” memories for you, right, John?!! Oh yes. Heading across campus with 20 MPH winds and a chill of about -20 degrees. Oh your doggie is so dogable! Happy Valentines Day & stay warm! You are right – the time for snow is Christmas and New Year and anything outside of that is simply an annoyance. Keep nice and warm – Dallas looks very snuggly! 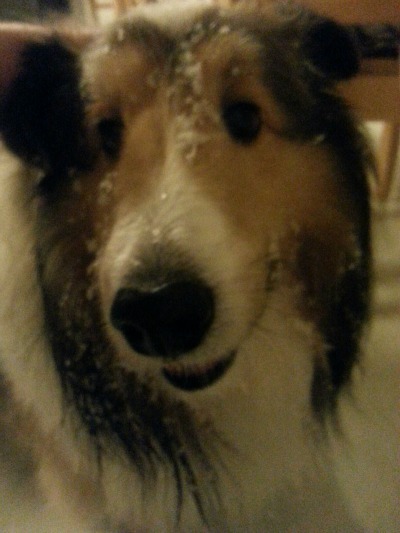 Another friend who agrees snow is best between Christmas and New Year’s — yay!! We’re hoping for melting SOON — today, it’s turned into a slushy mess. I’m not sure, Lucy, but I’ll wager you’d prefer snuggling with Dallas after he dries off, huh?!? Fingers crossed for a big thaw soon! I’m thinking that the lovely Dallas might be snugglier once dry, yes – although still super adorable! And when he’s dry, he doesn’t have that “wet dog” smell. Perhaps kitties don’t have that since they’re such fastidious groomers?! Believe me, they do! Terry absolutely stinks sometimes for no real reason at all. Smelly little bugger! HAHAHAHAHA! What an adorable picture! OMG Debbie, if I had been there I would have been rolling in that snow just like Dallas, because as you know….I LOVE snow! And speaking of snow, we’re supposed to be getting more sometime today. I’m off, so I’ll be outside ‘rolling’ in it. Also, last month we had a HUGE blizzard, which I will posting about. Have a super Monday and week, my friend! Ron, Dallas would love bouncing through the snow with you! He’s got a coat (booties, too), but he really doesn’t seem to get cold out there — and he won’t walk in boots at all. You should see the pitiful look he gives me when I put them on him! Yep, we’re sending the snow your way. We understand you haven’t seen near enough of the white stuff this winter, so we’re hoping you get to enjoy it — having a day off when it arrives will be just what you need! I’ve just decided to embrace the snow… *looks outside and shakes head* The dogs love it and Dallas looks like he does too! Go snow wrestle him! Well this seems a world away as the desert gets in the 90s here! Looks like Dallas had a good roll in the snow! Gee, can’t we find a middle ground, DD?? Your 90s sound as extreme as our snowy 20s. I’m hoping to find something between 50 and 75 year round!! You call four inches a storm? Why, when I was growing up in Iowa, we’d walk to school through four foot drifts. Uphill. Both directions. Uh — wait…. Not hate…just a teensy bit of envy!! Seventy-five sounds delightful, especially in mid-February. I know what you mean about the snow totals, too. I remember snows drifting clear to the windows when I was a kid. We haven’t seen much of those lately — some blame “global warming,” but I think it’s probably because so many more structures are built that “grab” the snow before it can drift. And perhaps it’s because the snows we do get are spread over larger areas. Who knows?? Oh, but Dallas is SO cute! I’ll bet he’s in all his glory romping around in all that snow. Lucy loves to play in the snow… but she’s not such a fan of the extreme cold. With his double coat, Dallas doesn’t mind the cold or the snow. Every time I send him outside, he rolls around in it, and the expression on his furry face is pure bliss. We got way more than they forcasted too. They said a couple of inches but it was more like a foot. But it will be 50 and raining tomorrow..and we are closer to spring! Our weather patterns in Switzerland are equally crazy. Snowing one day and spring temps the next. I don’t mind cold, but sure would like to see the sun once in awhile. A thick cloud, cover settles over our area and sits there for most of the winter.